I’ve been thinking about writing this post for a while now, at least since May. But, it isn’t a topic I really like to think about, let alone share with everyone – especially strangers on the internet. However, over the last few weeks, I have decided that I need to say something. For the last year, my husband and I have been trying to start a family. It hasn’t been an easy challenge. In fact, it is the hardest struggle I’ve ever faced. I am a guest contributor on my friend’s blog, NateTheWorld, and I recently wrote a piece about the pain of prayer and faith in the struggle of infertility, and if you’re curious, you should definitely go and read it. But, this isn’t about prayer or faith. This is about anger and frustration. Not at myself, though I deal with that month after month. No, I’m incredibly….hurt, by the actions of Enfamil and Similac. Some months my struggle is harder than others. May it was particularly painful. For starters, a lot of my friends had babies last year, so the first birthdays of all of those little ones was quickly approaching. I was also invited to a baby shower and finally, Mother’s Day. While most of my friends were celebrating their very first Mother’s Day, I was not. And I so badly wanted to be celebrating it for me. Of course I celebrated my own Mom, and my mother-in-law, and my sisters; and even my friends. But, while we were at church, listening to the wonderful message about a mother’s love, I couldn’t help but cry. Because I want to be part of that club. A few days before Mother’s Day, I noticed a package on my doorstep. 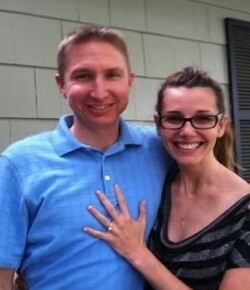 I wasn’t expecting anything, I didn’t think my husband was either, so I was curious what was there. When I opened the door and saw what it was, my heart sank and I couldn’t stop the tears that came. I showed Brett what it was and I could tell that he felt my pain. Sitting on my doorstep was a box of Enfamil. All on its own. Sent without my request, or knowledge. With the bright and cheery slogan of “Welcome to the Sisterhood.” Then, a few days later, I opened the pantry to get something and noticed a box of Similac sitting on the bottom shelf. I asked Brett what it was and he said another package had been delivered. Unbeknownst to me, it had shown up at the house and Brett, trying to save me from the pain and heartache, grabbed the package and put it away. 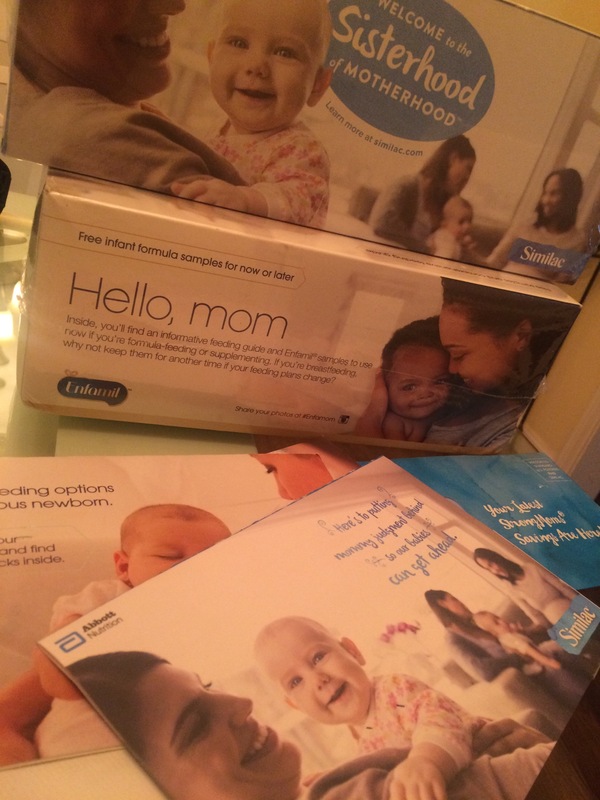 Here’s why – Enfamil and Similac don’t know who I am. They have no idea the struggle I am facing. They just know that somewhere, within the last year I spent a ton of money at Buy-Buy Baby and Babies R Us. They made assumptions about me that they couldn’t possibly determine were correct. And then I started to think about all of the women who were pregnant but miscarried. Or had a still-born. Imagine if those women are ALSO receiving this painful reminder of what they don’t have. This program is horrible. And it needs to stop. Do not send me things I didn’t ask for. You don’t know anything about me. I don’t have children. And I am fighting every. single. day. to keep it together because I want them. I just haven’t been able to make one. And now I frequently receive coupons with the stupid Sisterhood message on them. Only problem with that, Enfamil? I’m not part of that sisterhood. I’m dying, every single month, and you keep sending me reminders that I’m a biological failure. Thanks. So, you know what Enfamil and Similac, if I DO ever have a baby, and I decide to use formula to feed that baby – I will NOT be using yours. Because you are so out of touch with me that I refuse to give you even one penny of my money. You need to end this program, or at least figure out a better way to target the right people. I don’t know what the solution is for that, but please, please, please stop sending me things I didn’t ask for. It’s torture. My stuggle is hard enough. I don’t need you to make it any more difficult. Sister, I’m so sorry about what your going through. My heart breaks for you. We love you so much, your a wonderful aunt to the girls and we are very excited to see you soon. I’ll say extra prayers for you!! How inconsiderate of a company to make such an assumption. I assume you called them to let them know how they hurt you by sending you stuff. I would donate what they sent to you to a food bank if they sent you formula. I will keep you in my prayers daily . I am sorry you have to go through this, you just know you are a wonderful , loving woman and a very strong person . I also know that pain of infertility. Many don’t understand how deeply that desire goes and to be so very disappointed month after month. I’m sorry that what should have been a well meaning gift instead brings up the pain of what you do not have. At 54 I still have the pangs of never being called Mom. I cannot imagine how fulfilling that must be. I pray you will find that joy that I missed. Rita, my heart aches for you. I know that their gifts were well-intentioned, and sent without malice, but that hurt is still there. I tried to make something positive out of the pain, though; I took all the formula samples and coupons to our church and left them with our Early Education director so she could make sure they get to the people who need them most. I’m so sorry for what you’re going through. Companies need to think before they act. My husband and I have been trying for a second child for 4 years. Last summer I thought our dreams were coming true, but I ended up miscarrying at 11 weeks. 2 weeks after my should-have-been due date, I received a call in the morning at work congratulating me on my new child. I can’t even recall what company it was now, I was just trying not to burst into tears at my desk with all my co-workers around. I left work immediately and went home and cried the whole day. Thank you for sharing your story, and I hope with all my heart that one day you are blessed with the child you desire. I also hope that Similac and Enfamil and all the other companies that assume they know what’s going on smarten up and realize the amount of people that can be hurt from marketing attempts like that. Nicole, I am so sorry to hear about your struggles and about the painful reminder you received. I’ve been in touch with both companies about the programs in an attempt to shed light on a situation that *should* have been thought about ahead of time. My hope is that by sharing my story, however painful it is, it will be used to bring awareness and change. I pray that your hopes and dreams are answered and that you are able to have the precious little one you so desire. Nicole, I’ve been there with you. Had 6 friends and family pregnant while i was trying and not being successful. I survived one miscarriage and never want to go down that road again. I was finally able to conceive with a medical help. Just remember there are several women that are walking that road with you and have been on that road. Never give up. Thanks for sharing. Just remember things happen for a reason and it will happen when its suppose to. We don’t make the plans God does.